John Baptiste barrel tasting his whites. The headline above is enough to label me or anyone who would write it a bit of a wine snob. But that’s not really the point of the post. I was recently taken with a very nice glass of White Burgundy that I found surprisingly wonderful for a mere $25.99. First, the wine: Jean Baptiste Ponsot Rully 2012 would be an entry level White Burgundy (Chardonnay) from an extremely small producer in France’s famous Burgundy region. I bought the bottle along with two Burgundy reds (Pinot Noir) from a New York wine shop. But more on the back story in a second. John Baptiste in his vineyard. The white wine was stellar. From the first whiff at the rim of the glass I loved the hint of mineral and flowers. There certainly was a bit of wood going on as well. The wine offered soft fruit like a peach but what got me was the creamy texture but still a delivery of well-balanced acid on the finish. The back story is compelling. 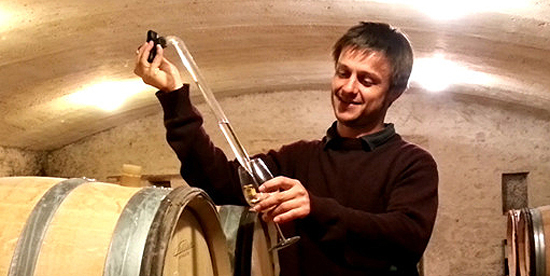 John-Baptiste Ponsot is just 35 years old but has worked the vineyards since he was 20. 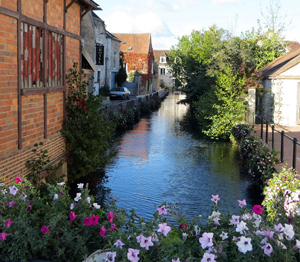 Rully is a small village south of Cote d’Or – the heart of Burgundy. The young winemaker watches over his 8.5 hectare (or 21 acre) vineyard and produces wines that sell out as quick as he can make them. The back story is a friend of a friend is an importer of small production Burgundy wines. His clients are little guys in the shadows of the bigger names of one of France’s most famous wine regions. But the wines are available retail – restaurant or shop – only in New York. The importer directed me to a New York shop that ships to Indiana. I bought the bottle described here along with the two reds. I’m really anxious to try the Pinots. I tell the story and sing the wine’s virtues to re-iterate the point that as you search the shelves of your favorite wine shop or visit a wine region, seek out the small producers giving every wine, every bottle, and each grape his or per personal attention. The wines will often astound you. The story one level deeper is I’m starting to plan a wine tour to Burgundy for 2016. 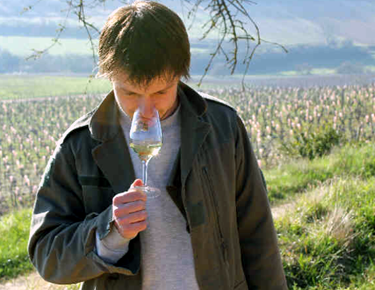 The importer friend – Benjamin Golden, Golden Vines – has already offered some suggestions for the trip. John Baptiste Ponsot 2012 Rully ‘en Bas de Vauvray, $25.99, Very Highly Recommended. Postscript: I will write about the two reds after tasting them. I would be happy to share the wine shop information if anyone wishes a real taste of Burgundy.